The 24 million people in Australia generate 1.5 per cent of annual global human-induced CO2 emissions. USA emits 14 times and China emits 26 times more CO2 than Australia. Australia has 0.33 per cent of the global population. Our high standard of living, a landmass of 7,692,024 square kilometres with a sparse inland population and greenhouse gas-emitting livestock combined with the transport of livestock, food and mined products, long distances to cities and ports and the export of ores, coal, metals and food for 80 million people result in high per capita CO2 emissions. Australia’s exports of coal, iron ore and gas contributes to increasing the standard of living, longevity and health of billions of people in Asia. If Australia emits 1.5 per cent of global annual CO2 emissions, 3 per cent of the total annual global emissions are anthropogenic and the atmosphere contains 400 parts per million by volume of CO2, then one molecule in 6.6 million molecules in the atmosphere is CO2 emitted from humans in Australia. This molecule has an atmospheric life of about 7 years before it is removed from the atmosphere by natural sequestration into life and limey sediments. Yes! One molecule in 6.6 million molecules in the atmosphere is CO2 emitted from humans in Australia. 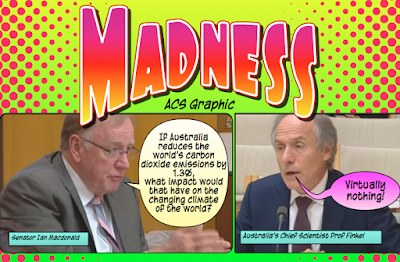 If we (ie Australia) reduced the world's carbon (dioxide) emissions by 1.3%, what impact would that have on the changing climate of the World? Do we have maniacs running this country? 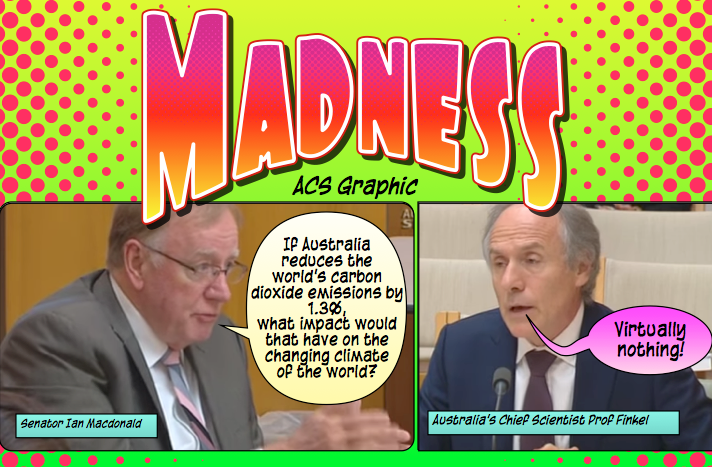 If Australia shut down all industry, turned all cars into scrap, turned off all power stations and returned to caveman lifestyle, what impact would that have on the changing climate of the World? To look good at the major carbon dioxide emitting IPCC gab-fests?